If you are a Bourbonr or have been to any of the numerous Bourbon blogs or forums you have heard stories of when Pappy could be found in the wild and Lot B and Old Rip would sat on liquor store shelves for months. This is no longer the case. Stores now have lists hundreds of names long months before the Fall release. Bottles of Pappy 20 and 23 selling on the secondary market for 1000% the retail price. To say that Pappy has hit a tipping point is an understatement. Originally, I wanted to write an article “Why is Pappy Van Winkle So Popular” however pinning down why something is popular is much tougher and often nothing more than a guess. Figuring out the “when” of the Pappy popularity will point to a few different events that boosted its success. First, a brief history of Pappy Van Winkle. As with most distilleries/bottlers the Van Winkles have a story dating to pre-prohibition detailing the origins of their bourbon. It is not really relevant to this post so I will skip over it (here it is if you would like to read). “Sometime after the Stitzel-Weller distillery was sold in 1972, Julian Van Winkle, Jr. resurrected the pre-prohibition Old Rip Van Winkle brand and initially used old whiskey stocks from the distillery for its bottlings. Julian Jr. died in 1981 and Julian Van Winkle, III (Pappy’s grandson) took over the Old Rip Van Winkle Distillery company. After the initial sale in 1972, the Stitzel-Weller distillery was eventually closed completely in 1991. Now that we have that out of the way lets take a look at the Google Trends below. As you can see Pappy first hits the search radar in December of 2006 and began to slowly increase, with search spikes every December, for the next five years. Bourbon in general has seen its own resurgence over the past few year and the Pappy growth trend appears to appears to be correlated with the Bourbon growth. 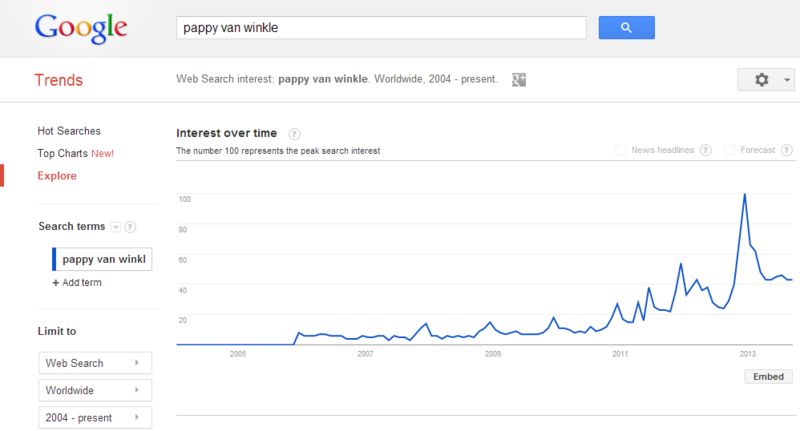 All of the sudden in December 2012 Pappy searches explode with almost double the amount of searches from December 2011. Now, Pappy is in every bourbon, spirit, wine, food, sports, journal, blog, forum, newspaper and magazine known to man. What is causing this significant growth? And, is it sustainable? I will let you draw your own conclusions for those answers. Feel free to leave your answer in the comments section. Have you tried one of these fine whiskies? Add it to your Whiskey Library and start reviewing bourbons now! I blame this Grantland article from June 2011 for the 2011 spike. I blame Anthony Bourdain and his Layover Philadelphia show that aired in December 2012 for the spike around that time. He drinks PVW20 (with 1 rock!) at Stateside bar. Poser. 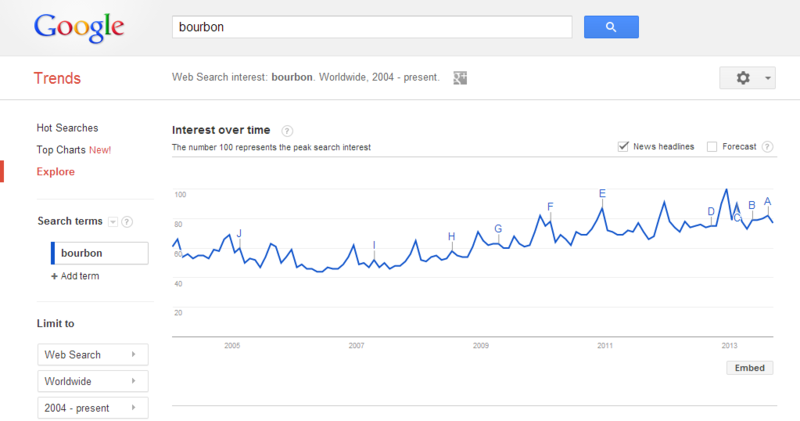 I believe allot of it has to do with the explosion of Bourbon Barrel Aged beers out there. Some of the most coveted of those beers are aged in PVW barrels as well. You have a community, the craft beer community that is, with a fair amount of disposable income, and liquor store connections, that have now added to the headache of trying to get any amount of bottles. Trust me, I am one of those people. That big spike going into 2011 was goose island rare– the first BA stout got the pappy treatment and blew beekgeeks minds. Not because of how good it was, but because it was $45 a bottle. At this time, bourbon county brand bombers were like $10 at Bevmo and if you were diligent, you could still find 4-packs of 2008 on shelves… It was released on black friday and people lined up in the Chicago cold like crazy. Made the beer release a mainstream thing and was essentially the downfall of western civilization as we know it.